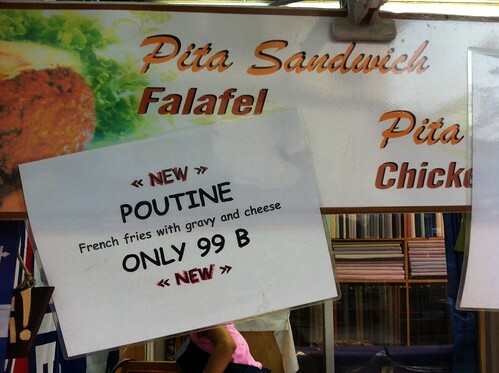 To my knowledge, there are 2 places selling "poutine" in Bangkok. 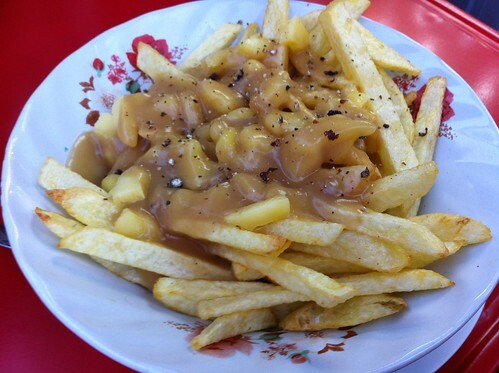 A "poutine" is a dish from Quebec, made of French fries, gravy and cheese. It's not a fancy dish. However, it's becoming more and more known, and there is nothing like it when you crave for it! Poutine is especially great after a night out having beer. The first place is Q-Bar on Sumkhumvit. Make a search on google. Q-Bar is using the traditional St-Hubert sauce. You can see pictures of it on flickr. I am sure that some Canadians might want to try!!! OK, we found it and we had a poutine! Bruno was not there but his wife, we presume, was. 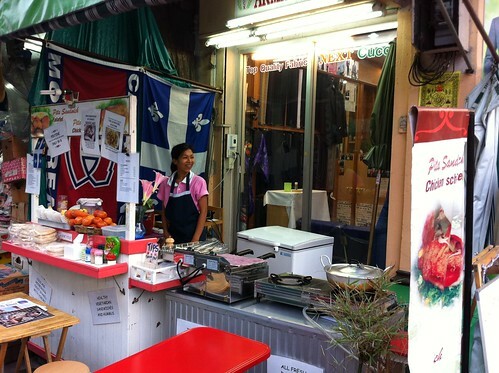 They are about 500 meters from Khao San Road. I think this is Bruno's wife. You can see the Canadian's Hockey club flag and the Quebec flag. It's on a corner of a street. Price was cheap, it was fine. I make mine with St-Hubert sauce.... that my family sends me! I think only people from Canada will understand this post. If Bruno comes in Nakhon Ratchasima, I promise him one of mine.